Kananaskis before the flood, and hopefully what it will look like in 2014. The group in front was stood in a line on the edge of the 4th tee on the Mt. Kidd Course at Kananaskis in Alberta. Curious, we approached to ask what the hold-up might be. The green at this 197-yarder is virtually an island surrounded at the front, back, and to the left by water and sand but, though very attractive, it’s not quite arresting enough to cause four well-traveled golfers (all of them golf writers) to be gorping like a party of tourists staring down into the Grand Canyon for the first time. But they stood spellbound, still, soundless. What could possibly have such an effect on golfers who had probably covered the globe playing the game? As we drew near, about to ask if we could play through perhaps, we saw what held their attention. Down on the putting surface frolicking with her cub was a grizzly that appeared no smaller than a Chevy Suburban. Now eight golfers lined up at the front of the tee box. A few minutes later there were 12 as the group behind caught up. The animals slowly moved away and the first group decided it was safe to tee it up. When our foursome eventually made it to the green, we jabbed at putts while scanning the nearby trees for signs of the bears. While walking off the green, we caught sight of them fishing in the river to the right of the 5th fairway. My partners chose to continue but, having played plenty of golf holes in my time and never having seen a grizzly, let alone two of them, angling for salmon about 100 yards away, I took a time-out and walked up the riverbank maintaining what felt like a safe distance, and watching something I knew I might never get the chance to see again. An incident like that would be enough for most people to remember the course at which it happened for the rest of their lives. But Kananaskis, with 10,000ft limestone peaks for a backdrop, is so breath-takingly scenic it probably doesn’t need grizzly sightings to remain lodged deep in the old memory banks. Robert Trent Jones who designed both the Mount Kidd and Mt. Lorette Courses, which opened in 1983, called Kananaskis the best natural setting he’d ever been given to work with. Considering he’d been designing courses since forming a partnership with the great Canadian architect Stanley Thompson in the early 1930s, it was quite the statement. Alas, you will have to wait until 2014, possibly later, to experience the majesty of Kananaskis because the hundred-year flood that hit the southern half of the province last week swept much of the place away, images showing a level of devastation that you can’t just mop up in a week or two (thanks for indulging me while I remembered the grizzly moment. Hard to stop that story once I start). Darren Robinson, the General Manager, closed the course for the rest of 2013, saying it will be ‘some time before the courses are playable again’. If you had planned on playing Kananaskis as part of your trip to the Canadian Rockies, dropping it from the itinerary is indeed a big blow. But don’t let it stop you playing its sister courses which either survived the flood entirely intact or suffered only limited damage. At the north end of Highway 93 – too far north for the floodwaters thankfully - is a course so good it’s worth the drive from Bellingham by itself. Jasper Park Lodge is an epic Stanley Thompson design that opened in 1926 and which never tries to outdo the surrounding mountains but instead blends with them perfectly, making every stride and every shot an absolute delight. Likewise open for play and likewise brilliant – part of the trip’s conversation will actually be an animated discussion on which is better – is Thompson’s other Alberta masterpiece, Banff Springs. One hundred and eighty glorious miles south of Jasper on the Icefields Parkway, Banff opened in 1929 and cost roughly $1m making it the most expensive golf course ever built at the time. The money wasn’t an issue, however, as the client - the Canadian Pacific Railroad, was happy to spend whatever it took to one-up the rival Canadian National Railroad which had built the resort at Jasper. Jasper Park Lodge - a Stanley Thompson masterpiece. I‘d give Jasper the nod…just, but you’ll find plenty of golfers who would vote the other way. And if you told me our trip involved two rounds at Banff and only one at Jasper, I certainly wouldn’t quibble. The former coal-mining town of Canmore, 50 miles west of Calgary and 15 miles south of Banff on Hwy 93 (which has actually become the Trans-Canada Highway by now), is home to the Canmore Golf & Curling Club which welcomes non-members who can not only play the lovely golf course built entirely by members of the local community in 1926, but also rent the ice at $60 an hour for a wee game of sliding the rocks. Canmore is also within easy striking distance of two more exceptional layouts – the dramatic Les Furber-designed Silvertip which straddles the line between entertaining and over-the-top, and the very highly-rated Stewart Creek, designed by Gary Browning. The front nine here survived the floods largely unscathed. The back was quite badly damaged, however, but re-opened on July 15th thanks to a Herculean effort by two sets of greenstaff – Stewart Creek’s own crew plus a few from Canmore G&CC (the Canadian Rockies courses are a tight-knit bunch – each pitching in to ensure the health of the group). The loss of Kananaskis, for 2013 at least, will inevitably put a damper on your trip to Alberta. But with two of Stanley Thompson’s finest works and three other courses still open for business, it’s certainly not a deal-breaker. And you still might get lucky and see a grizzly. 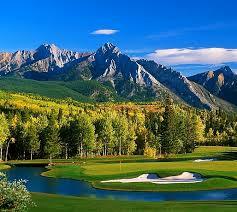 For the latest course information and package information, visit canadianrockiesgolf.net (or call 855-835-8484).